Last racing at the high-speed, scenic course of Monza for the Italian Grand Prix, the 2010 Formula 1 cars challenge this week is a 3.148 mile street course in Signapore's Marina Bay. 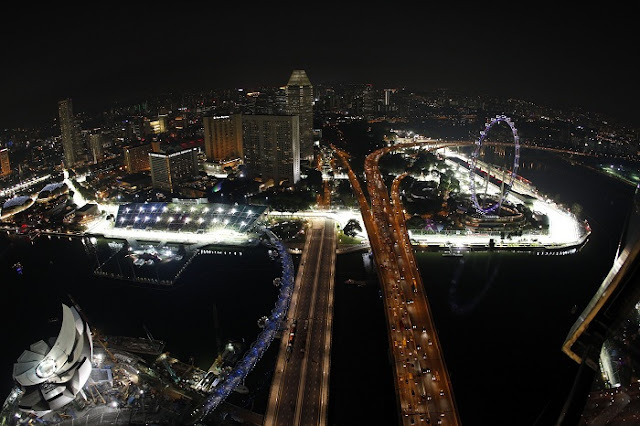 The only night race on the Formula 1 circuit, the Singapore Grand Prix adds the additional spectacle of artificial lighting shining down on the high-speed race machines. Though an entirely different track from the historic Monza circuit, the results out of qualifying for the Singapore Grand Prix saw Fernando Alonso and the Ferrari team repeating their pole-sitting efforts. Also unlike the Italian Gran Prix weekend, the wet track at Marina Bay led to longer than usual laps as teams were forced to rain setups. Posting fastest time in the Q1 session, Alonso's main opponent through the Saturday night time trial session came from Red Bull Racing's Sebastian Vettel. Vettel took the Q2 fast time transitioning into the final session where the Ferrari posted a lap time at 1 minute, 45.390 seconds beating out Vettel's Red Bull-Renault by less than 7/100th of a second. The 2008 winner of the Singapore Grand Prix, Fernando Alonso would have his victory overshadowed by the conduct of his then-team Renault F1 which eventually led to the team's Team Principal being suspended. In 3rd and 4th, the McLaren-Mercedes cars continue to show presentable into the late stages of the 2010 season as the team remains in tight constructor championship battle with Red Bull Racing separated by only 3 points entering Singapore. Defending Signapore Grand Prix winner Lewis Hamilton found an edge on the defending Formula 1 champion teammate Jenson Button. The second Red Bull-Renault driven by current F1 driver points leader Mark Webber placed 5th in qualifying promising a heated battle for Singapore Grand Prix points. While success found one of the Ferraris in Formula 1 at Singapore, Felipe Massa suffered a gearbox failure immediately after taking to track for an initial timed run in the first qualifying session. Unable to post a time, Massa finds himself directly opposite of his teammate Alonso on the Formula 1 grid. 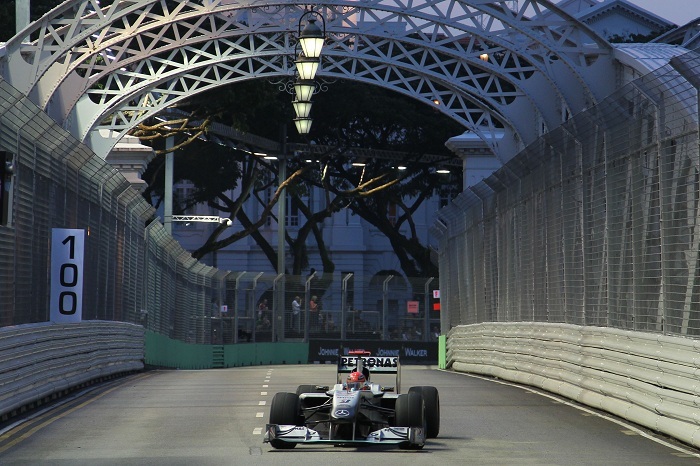 Starting Sunday at 8 P.M. in Singapore, the race time in the North American eastern time zone will be at 8 A.M. Sunday morning.